Power BI Workspace Collections use Keys and App Tokens for authentication and authorization, instead of explicit end-user authentication. In this model, your application manages authentication and authorization for your end users. When necessary, your app creates and sends the app tokens that tell our service to render the requested report. This design doesn't require your app to use Azure Active Directory for user authentication and authorization, although you still can. Power BI Workspace Collections is deprecated and is available until June 2018 or when your contract indicates. You are encouraged to plan your migration to Power BI Embedded to avoid interruption in your application. For information on how to migrate your data to Power BI Embedded, see How to migrate Power BI Workspace Collections content to Power BI Embedded. Key - You can use keys for all Power BI Workspace Collections REST API calls. The keys can be found in the Microsoft Azure portal by selecting All settings and then Access keys. Always treat your key as if it is a password. These keys have permissions to make any REST API call on a particular workspace collection. App token - App tokens are used for all embedding requests. They’re designed to be run client-side.The token is restricted to a single report and its best practice to set an expiration time. App tokens are a JWT (JSON Web Token) that is signed by one of your keys. ver The version of the app token. 0.2.0 is the current version. aud The intended recipient of the token. For Power BI Workspace Collections use: https://analysis.windows.net/powerbi/api. iss A string indicating the application that issued the token. type The type of app token that is being created. Current the only supported type is embed. wcn Workspace collection name the token is being issued for. wid Workspace ID the token is being issued for. rid Report ID the token is being issued for. username (optional) Used with RLS, username is a string that can help identify the user when applying RLS rules. roles (optional) A string containing the roles to select when applying Row Level Security rules. If passing more than one role, they should be passed as a sting array. scp (optional) A string containing the permissions scopes. If passing more than one role, they should be passed as a sting array. exp (optional) Indicates the time in which the token expires. The value should be passed in as Unix timestamps. nbf (optional) Indicates the time in which the token starts being valid. The value should be passed in as Unix timestamps. There are methods available within the SDKs that make creation of app tokens easier. For example, for .NET you can look at the Microsoft.PowerBI.Security.PowerBIToken class and the CreateReportEmbedToken methods. For the .NET SDK, you can refer to Scopes. When using Embed tokens, you may want to restrict usage of the resources you give access to. For this reason, you can generate a token with scoped permissions. The following are the available scopes for Power BI Workspace Collections. Dataset.Read Provides permission to read the specified dataset. Dataset.Write Provides permission to write to the specified dataset. Dataset.ReadWrite Provides permission to read and write to the specified dataset. Report.Read Provides permission to view the specified report. Report.ReadWrite Provides permission to view and edit the specified report. Workspace.Report.Create Provides permission to create a new report within the specified workspace. Workspace.Report.Copy Provides permission to clone an existing report within the specified workspace. You can supply multiple scopes by using a space between the scopes like the following. Copy the API keys to your application. You can get the keys in Azure portal. Token asserts a claim and has an expiration time. Token gets signed with an API access keys. User requests to view a report. Token is validated with an API access keys. 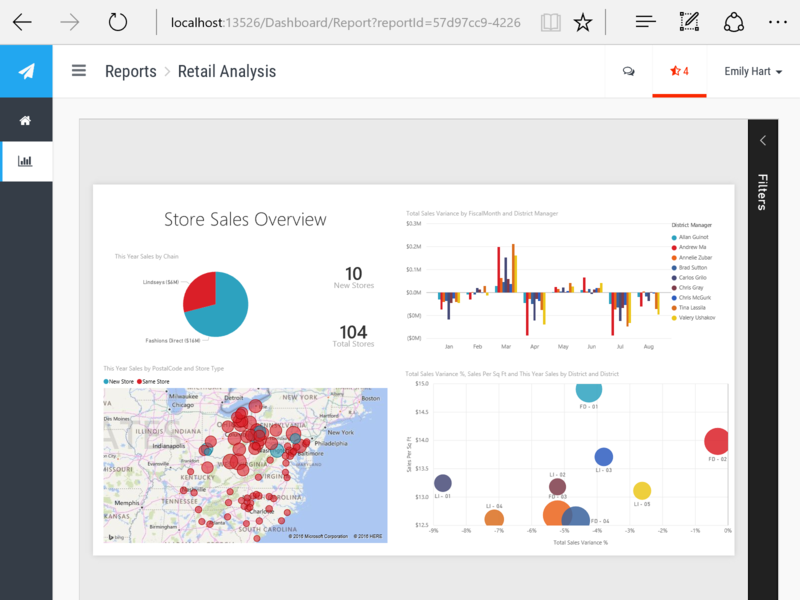 Power BI Workspace Collections sends a report to user.